This is a powerful and important message, especially today. And while there are many works in SAM’s collection that give visual form to the freedom of worship, there are also a number of works that represent the opposite narrative: religious freedoms being taken away. For example, there are a number of objects in our Native American galleries whose value and function during potlatches tell a different story of persecution, as such ceremonies were banned by in 1885. Unfortunately, there are too many stories like this told through our material and visual culture. So, when thinking about freedom of worship, we must also ask who is free to worship. In the piece pictured here, Dream of the Language Wheel, Guy Anderson offers up a unifying religious message. 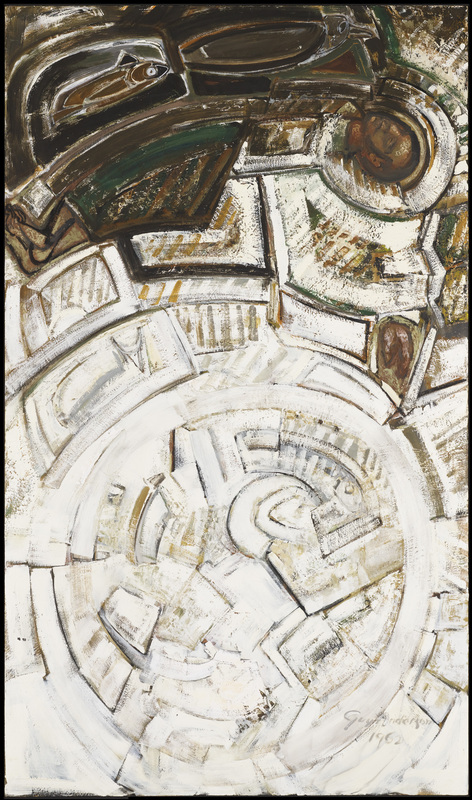 A member of the Northwest School, Anderson was a peer of Mark Tobey and Morris Graves and known for his abstract “mystic” paintings that incorporated motifs ranging from Zen Buddhism to Hinduism to Native American cosmologies, among others. Formally, the painting exhibits a degree of visual tension due to its divided canvas with dark and light elements. Embedded within the upper half are symbols from Northwest Coast groups—such as a fish and raven, whose treatments reference the iconic formline style of the Tlingit, Haida, and Tsimshian peoples. In the lower half, we see early Christian symbols similarly contained within an abstract field. While this work could be interpreted through a lens of cultural appropriation, Anderson’s blending of spiritual practices and cultures other than his own evinces the artist’s freedom of worship, developing a unique brand of spirituality which manifested itself artistically. It is also no accident that Anderson brings together Native American and early Christian iconography, given the long and fraught history between Native communities and Christian colonizers; however, the title of the work—Dream of the Language Wheel—holds, I think, an important key to the work’s meaning. A tool used to help find and translate words among different languages, a language wheel is meant to make things synonymous—that is, forge similarities. Perhaps Anderson believed that art was that thing, like a language wheel, that could unite us rather than divide us, showing us how we are more similar in our religious beliefs than we are different.